What a fantastic month here in South Ari Atoll! Perfect visibility, calm seas and gorgeous sunshine. Niklas and Sonja decided to take the opportunity to proclaim their love for each other with a breathtaking underwater proposal (she said yes! ), even though Sonja thought it was a media stunt for Facebook at first! 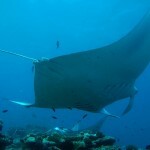 Mantas have been seen on almost every full day excursion, and we have welcomed new instructor Rafa to the team. Earth Hour Day saw over 20 of our divers along with the team members cleaning up the house reef on Vilamendhoo, and some very happy faces enjoying the complimentary refreshments afterwards. On behalf of the whole team at Vilamendhoo, we wish you a Happy Easter and hope to be diving with you soon!